Great news! The Library of Congress recently inaugurated and honored the 6th National Ambassador for Young People’s Literature – author extraordinaire: Jacqueline Woodson! Having served from 2015-17 as the Young People’s Poet Laureate for the National Poetry Foundation (with the mission of raising awareness as to the fact young people have a natural receptivity to poetry and are its most appreciative audience), Ms. Woodson joins an elite group of former ambassadors: Jon Scieszka, Katherine Paterson, Walter Dean Myers, Kate DiCamillo and Gene Luen Yang. Her adopted platform as Ambassador will be an equation: Reading = Hope X Change (for your time). “Good literature asks the reader questions about the moment they are in” Ms. Woodson recently told an audience at the Library of Congress. Associated equations include: Reading = Freedom; Me + You = Conversation; and Hope – Fear = Change. When a child reads, Ms. Woodson notes, change is capable in the reader’s heart, hands, and head. “Books change us and help us see worlds and identities never met before,” she adds. 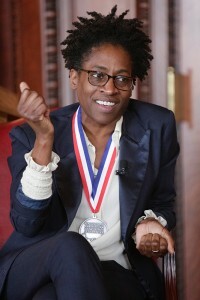 Jacqueline Woodson, our new National Ambassador for Young People’s Literature, at the Library of Congress inauguration, January 9, 2018.